The pantograph is never used when the train is moving. The whole purpose of it is to power the equipment when there's no loco coupled to the train. As an example of a gas using car, i would like to add the old rheingold restaurant cars that used steam heating and gas stoves. This was before the TEE era though and these mostly ran with steam locomotives. Many east european companies use jumper cables connected to the head end power line for stationary heating and supply during locomotive exchanges. (earlier there were steam lines in use) One of the main reasons pantographs were not really needed on restaurant cars there. Only a the cars sent for international routes or used with locomotives without head end power had self contained hvac, first coal/gas heating and later diesel generators, either under the cars or in a dedicated heating/generator cars. Some of these older cars also had axle generators for lighting. I picked up the beginning of an epoch IV IC train. I got the red/beige units in a smokey little second hand train store in Hamburg for a great price. A couple of the boxes are worse for wear, but the wagons themselves are in good shape. The 2nd class coaches are harder to find. I picked this one up in Berlin on my last day. 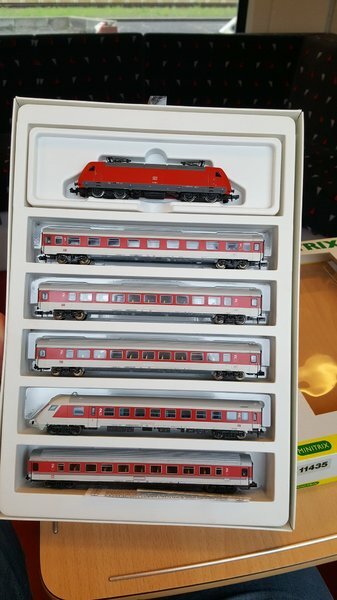 I also decided to get an Epoch VI IC train, but none of the prices in Germany were better than a US online importer I found, so I decided to get them later. Not a good decision - I went to buy them last night after arriving home and all except the steuerwagen are sold out. I would have bought them a couple of days ago but I was on the fence about getting the Class 101 with or without sound. Originally I was going to get it DC and add a cheap decoder, but I asked for a demo in one store. That was a mistake. After seeing/hearing it I had a major conflict between my heart and my head. The heart was winning so my head said "let's wait a few days and decide". 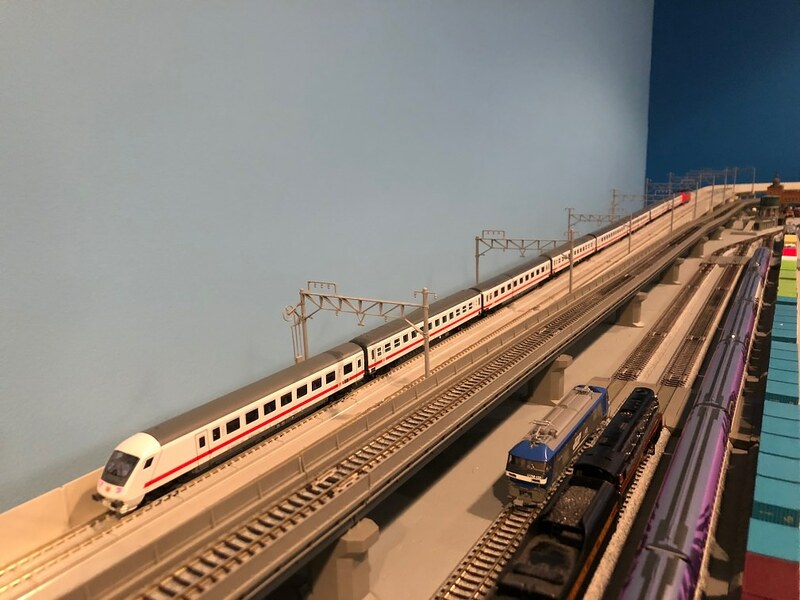 Got my first German train running today - an epoch IV IC train. I still need to get two or three 2nd class coaches. I'm trying to track down an out-of-production one with working tail lights. Epoch VI IC train almost complete. Just waiting for a Class 101. Currently it's being pulled by an EF-210. I just love the Steuerwagen. Thanks everyone for helping me understand these trains. Very nice! Kinda jealous at the Steuerwagen, as these usually go for way more than I'm willing to pay. People are just crazy about the ICE colour ones. I only have one in the previous IC colour. I also like the Epoch V colors. I may add one of those in the future. I've seen these with a mix of blue and red painted coaches. I like how the color mix looks. Is the picture you posted here actually taken on board a train? I like how the color mix looks. Is the picture you posted here actually taken on board a train? You can also mix the Ep. V with the Ep. VI IC coaches. They ran mixed for quite a while. And yes, you are right. I took the photo aboard an Abellio Talent 2. 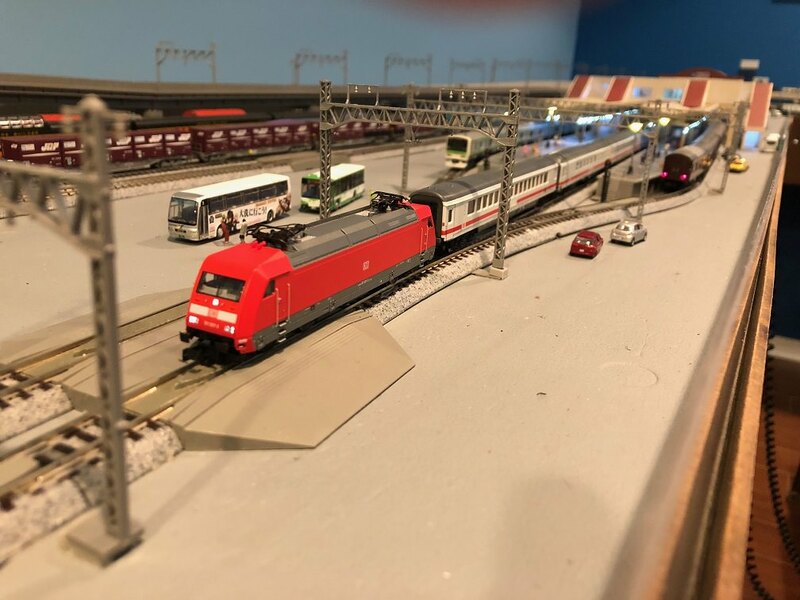 Bought the IC set in a little model shop in Eisenach. I need to get some ep V or VI IC cars. I have a 101 in my basket at Lippe waiting for some decoders to restock and I have a 103 or two in dual colors which also ran (runs) an IC or two in more modern times. Whose car with tail lights is that? It's Fleischmann. It was a little tough to track down. I got it from a Dutch shop called Pijp-Lines Modelbouw. Fleischmann BR101 with Arnold coaches. The Arnold coaches are mixed Ep V and VI per the labels but they are all white with red stripe IC coaches except the restaurant, which is the red IC livery and came with 2 of the white coaches in a set. I don't yet have a cab car for the end and need a few more 2nd class cars. Of course, I dropped the BR101 locomotive onto the concrete floor in my basement office when a sleeve caught the pantograph and pulled it off the table. Luckily no more damage than one buffer compressing a little and some pieces from underneath one of the couplers bending a little which I was able to fix. ....Except for one thing. The giant pantographs are so tall they snag on some of the catenarys. 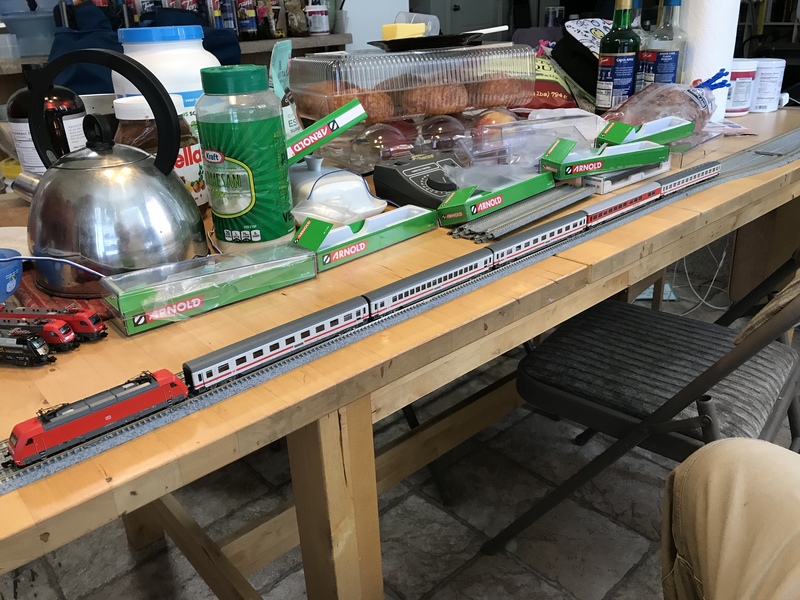 I really love my Epoch IV and VI IC trains. I'm tempted to start looking for an Epoch V train. Do it! I found that epoch V IC coaches are quite easy to acquire and rather cheap as well. Cab cars and restaurants are especially cheap, compared to epoch VI. I'm still lusting after an epoch VI cab car and restaurant with pantograph, but so far the prices weren't agreeable at all. What stops me the most from getting the most recent set is the fact that the BR101 does not have tail lights. Except if you purchase the expensive DCC only Minitrix version. Do it! I found that epoch V IC coaches are quite easy to acquire and rather cheap as well. Thanks. That's great to know. I think I'll start researching what cars the train "should" have, (1st class, 2nd class, reataurant, etc) and then start shopping. 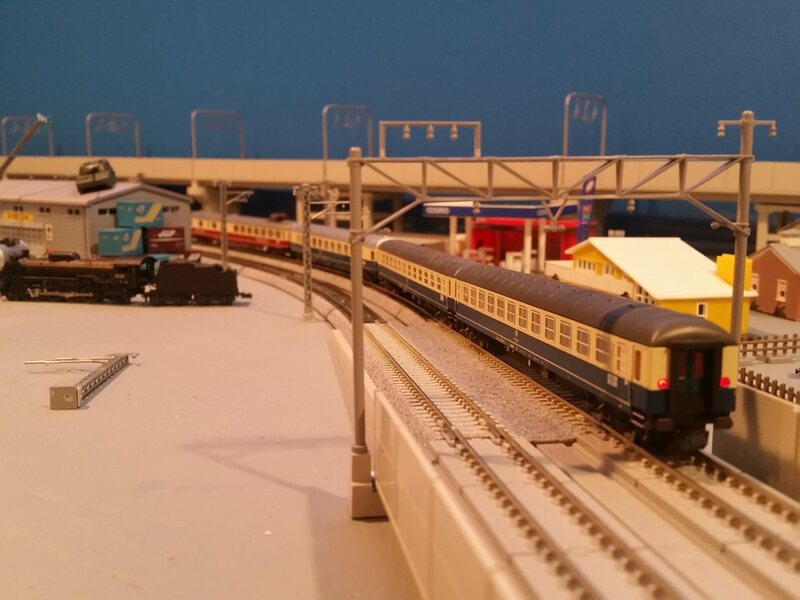 I'll go for a loco and 8 cars as that's what my station fits. Cab cars and restaurants are especially cheap, compared to epoch VI. By "cab car" you mean the "steuerwagen" right? non-powered passenger car with a driver cockpit at one end. I thought you already had a Steuerwagen. Didn't you post one a while back? Btw, what brand cars have you got? Anything you're especially happy/unhappy with? Any buying sites other than ebay and hattons you can recommend. Also, I haven't looked at manufacturers yet. Do you happen to know if any company currently has epoch V in production. I tend to favor Fleischmann but that's mostly out of habit. I have almost no experience with other German manufacturers. I agree it's a shame that the 101 doesn't have tail lights. I never by the digital version, as it's almost always much cheaper to convert them myself. In general it's simple to add tail lights to a loco. The only trepidation I have with the Fleishmann 101 is that it's already designed as a plug-in install for the decoder, which couldn't be easier. I suspect that bypassing that may call for a complete disassembly, which is a PITA. But even so, I still love my BR101 even though it doesn't have red lights. Do you know off hand if any other loco was used to pull the Epoch V IC? Wasn't there an issue with the locos being painted a slightly different shade of red for a while? 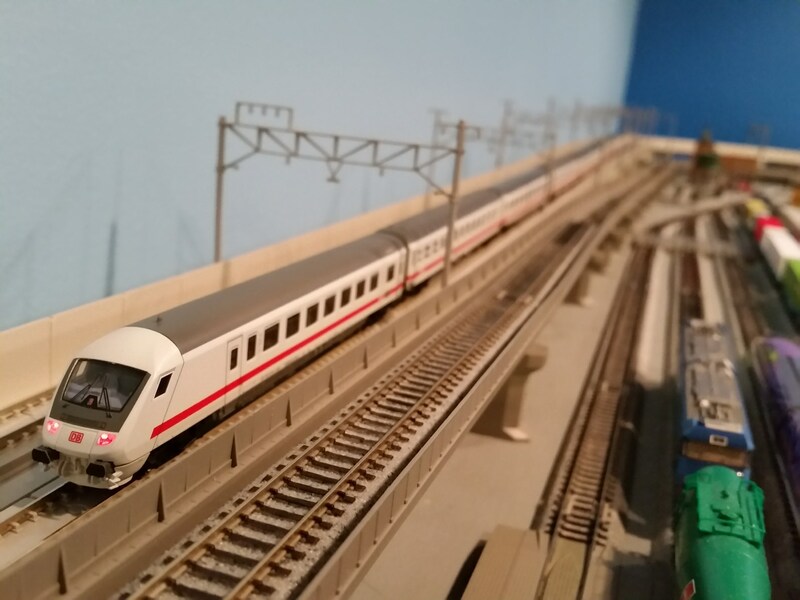 Before you had the blue/gray Interregio, oriental red/gray Inter/Eurocity (same colors as the original ICE stripe), then big bar traffic red without gray (also used in the final CNL livery), and now the white with red band. These were all mixed during transition periods, so you could have very colorful compositions. Currently they are changing the livery slightly with different fonts and 1st class designations, like they do for the ICE renovated trains and ICE 4. BR 120 and BR 103 are traditional loco's used (to this day) to haul IC/EC trains, besides the BR101. I haven't seen an oriental red loco in a long time. But the BR103 with old logo in beige/red TEE colors used to be a common occurrence until recently. I only got epoch V IC Steuerwagen. I buy whichever cars I can get for the price I'm willing to pay for them, no manufacturer restrictions. 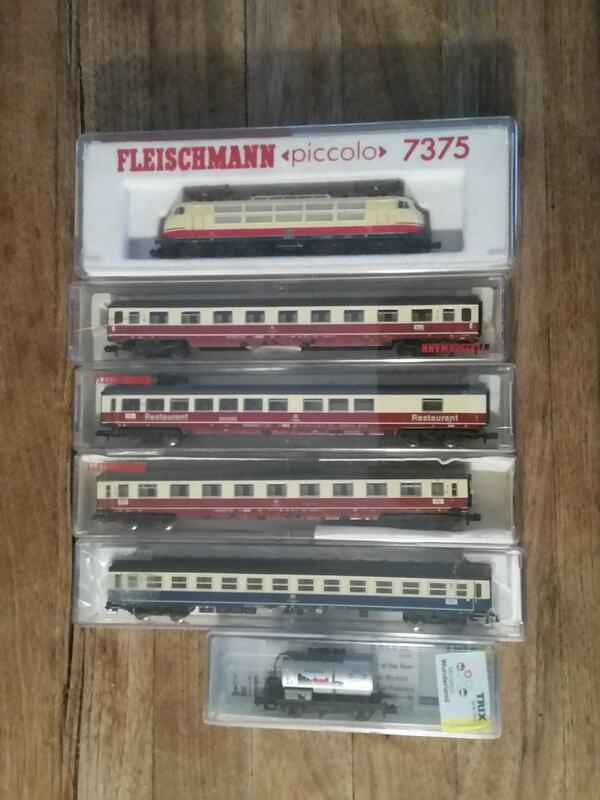 However, my favourite IC cars are the ones made by Roco and the Fleischmann models that use the Roco molds. Most IC coach models suffer from sitting too high, the Roco models are probably the lowest of them. They also come with folding door steps molded, which many models (even today) do not have. Second place for me is (Hornby) Arnold stuff. Those coaches are quite nice. Last place would definitely be Minitrix. Their coaches are often absolutely overpriced and just feel and look like toys, as they tend to miss small details (like door steps). But the BR103 with old logo in beige/red TEE colors used to be a common occurrence until recently. Until December 2016 to be precise. 103 245 was used on ICs out of Munich. Widespread use ended around 2003, so it's still a good loco for epoch V ICs. Around that time almost all of them wore the current DB logo though. I loved seeing the old brute in the old TEE colors! I used to see it every morning heading to work as it pulled the IC from Ulm to Munich (with the old logo). Just as much how I loved the ALEX trains having their restaurant cars in the old TEE colors also! Just collecting some Manufacturer/model info. I'll start with Fleischmann. Just using Reynolds as a reference as they have good pictures and info even for sold out items. A page about various DB 103 models to look through later. I also like these. But IR is a different train, right. That may be a future project. This is the scheme feature in my post above featuring Fleischmann Era V cars? CNL? With a quick search I don't see this scheme modeled. I'll look further later. Interregio is kinda like a step between regional train and Intercity. If I recall correctly it didn't need a special ticket either. But the interregio train was later scrapped and repainted to the IC/EC liveries. They did run together with red cars later. 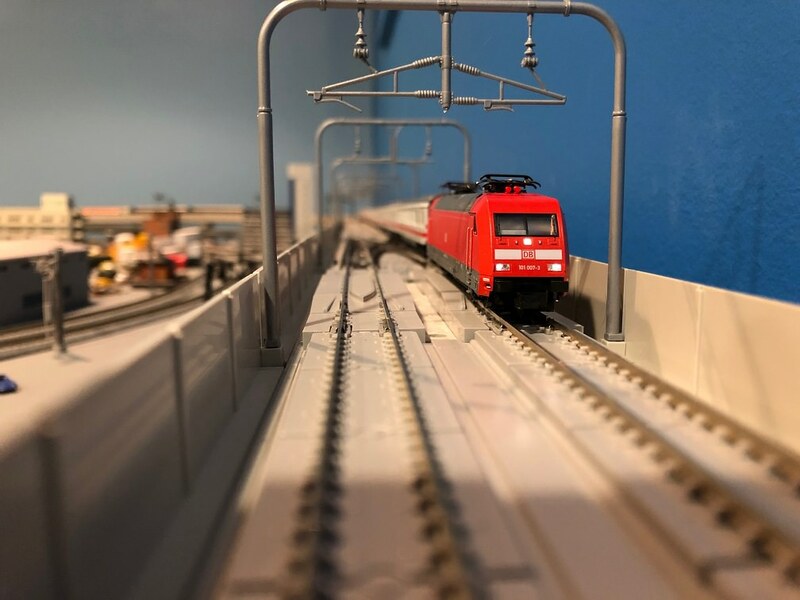 Another example is the Königssee train which also had interregio and orient red colors together. Why, I am not certain, but I'm sure @Suica knows. Here you go. 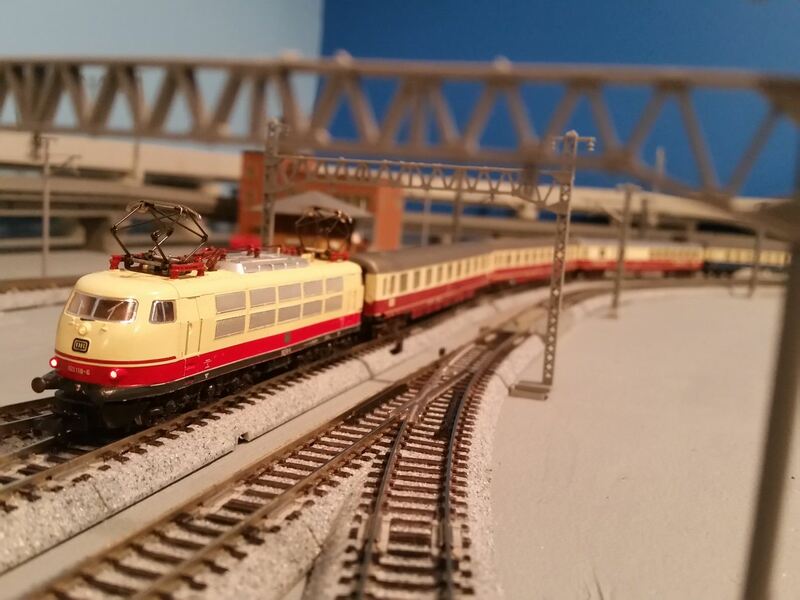 LS Models makes these, but Minitrix/Fleischmann has also modeled some cars (as normal autozug, nachtzug etc.) which usually go for super dirt cheap because nobody wants them.